Clinic Synopsis: The clinic will offer a detailed examination of common technical and musical issues confronting the modern percussionist during a march performance. Topics will include the anatomy and history of a march, instrument selection, printed part adaptation, and musical interpretation. Topics discussed will be supported with live performance demonstrations with recorded accompaniment by the West Point Concert Band. We will also provide educational materials (see below for details). 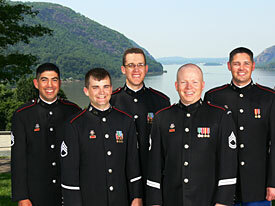 Clinician Biographical Information The West Point Band is the oldest unit at the United States Military Academy and the U.S. Army’s oldest active band. It traces its roots to the Revolutionary War. With the establishment of the United States Military Academy in 1802, came an increased demand for military music. As the academy grew, it needed fifers, drummers and buglers to drill new cadets and provide audible order to their duty day. Today, as the senior premier musical representative of the United States Army, the ensemble has collaborated with some of the finest musical organizations in the country, including the New York Philharmonic and the Boston Pops. Comprised of graduates from America's finest music schools, the musicians of the West Point Band present emotionally stimulating performances while providing the Corps of Cadets with a piece of living history.